Just a friendly reminder that one of the Super Nintendo's best and brightest hidden gems is now live on the Wii U Virtual Console. Capcom has delivered me a wonderful birthday present by making one of my all-time favorite video games more widely available than ever before, even back during its initial launch! 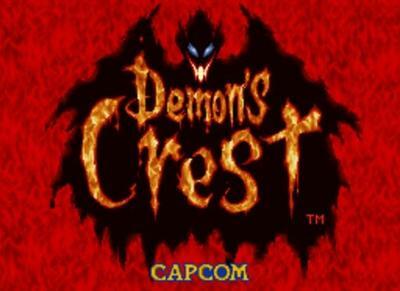 Demon's Crest is a staple of my childhood and a game I will love until my dying day. I remember playing it deep into the night, terrified of the haunting atmosphere and downright scary enemy designs. Even the protagonist Firebrand is something to shudder over, which is not all that common in the world of video games anymore. It might progress a lot like the open-ended Super Metroid, but Capcom's approach sews in a few new ideas to the formula like an overworld map, mini-games, stores, and elemental powers that transform Firebrand into a wide array of scary monsters. Each has a power that opens up more places to explore, secrets to unlock, and dare I say a story that is more satisfying than most of its peers at the time. Maybe it's the nostalgia talking, but Demon's Crest is sadly one of gaming's most underrated masterpieces. For all the popularity and love that its parent series, Ghosts 'n Goblins, gets for pounding a generation of gamers into submission, Firebrand's sub-series is superior in every way, and Demon's Crest is the peak. If you own a Wii U and need a scary game to hold you over through a night of trick or treating, then please give this game a try. $7.99 is more than a fair price for the frights, chills, and especially satisfying game hours you can get from this sadly overlooked cult-classic.